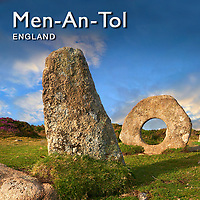 The men-an-tol are 3 standing stones standing amongst the heather on the Penwith peninsula, Cornwall, England. Two upright stones about 1.2 mt (5ft) high stand either of a circular stone with a hole in it. The stones could have come from a larger stone circle and the circular stone may have been at the centre of the circle. 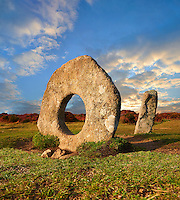 Stones with a round hole are not common in Cornwall, the best know being the Tolven Holed Stone. Legend suggests that it was though that by passing an injured hand, foot or head through the hole in the stone would bring about healing. Foklore has it that the stones had a fairy or piskie guardian who made miraculous cures. It was also believed that passing a naked child through the hole in the centre of the stone nine times would cure a child of rickets. Like everything neolithic the meaning of such monuments as men-an-tol will never be known.